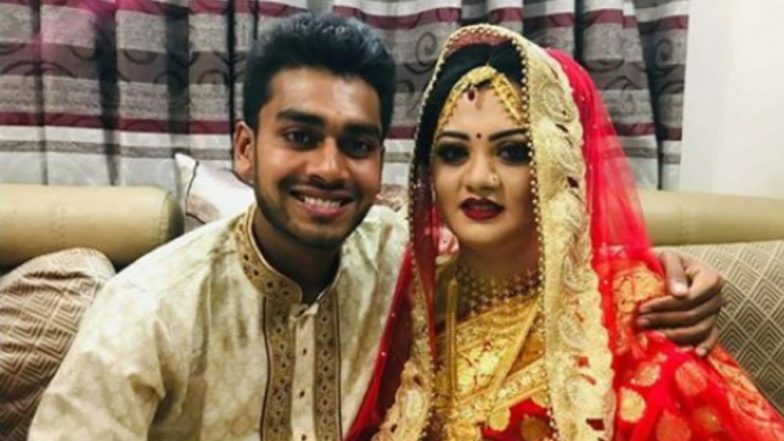 Days after the Bangladesh cricket team narrowly escaped the New Zealand terror attack in which a shooter live streamed his attack on two mosques in Christchurch, Bangladeshi cricketer Mehidy Hasan Miraz got married to his long-time fiancee and began a new innings in his life. New Zealand Terror Attack: Five Indians Confirmed Dead in Christchurch Mosque Massacre, Death Toll Rises to 50. When the shooting began on March 15 in a New Zealand mosque during Friday prayers, Bangladesh players and coaching staff were "50 yards" from the Al Noor mosque in Christchurch. 50 people were killed in the shooting and several wounded after an Australian born 28-year-old opened fire in the mosque. Mehidy Hasan Miraz's father Jalal Hossain said Miraz, 21, married Rabeya Akter Priti at her house where both the families were present. The couple, who were in a relationship for six years, will complete the wedding reception after Eid-ul-Fitr, the Dhaka Tribune reported. "Alhamdulillah...I am starting a new journey in my life today. I would like to request the blessings of all my fans and well wishers for my new beginning. May the Rahmat of Allah always shower upon us," sharing a picture. Mehidy Hasan has played 19 Test matches, 25 ODIs and 13 T20s.